‘Tis the season for Thanksgiving potlucks! There is something special about gathering with your closest friends to enjoy a plate full of homemade dishes. I have a couple different Friendsgiving and work potlucks coming up in the next couple of weeks and I am in full on research mode, gathering up recipes and choosing which dishes to bring. I figured many of you might be in the same boat so I wanted to share some of my trusty potluck standbys and some new recipes I am considering! Brie and Jam Bites – these little sweet and savory morsels are so easy and delicious, they are my go to appetizer for any event or potluck. These require minimum prep thanks to using the pre-made phyllo shells and I usually use this version from She Wears Many Hats with brie and apricot jam, but you can switch it up by using goat cheese and fig jam or cream cheese and pepper jelly. Turkey Meatballs – If your friends are anything like my friends, your Friendsgiving may be missing the main event, the turkey. Cleaning, stuffing, basting, hours in the oven – ain’t nobody got time for that. These meatballs are just the trick to get a taste of turkey without spending hours in the kitchen – just swap out the marinara sauce for gravy! 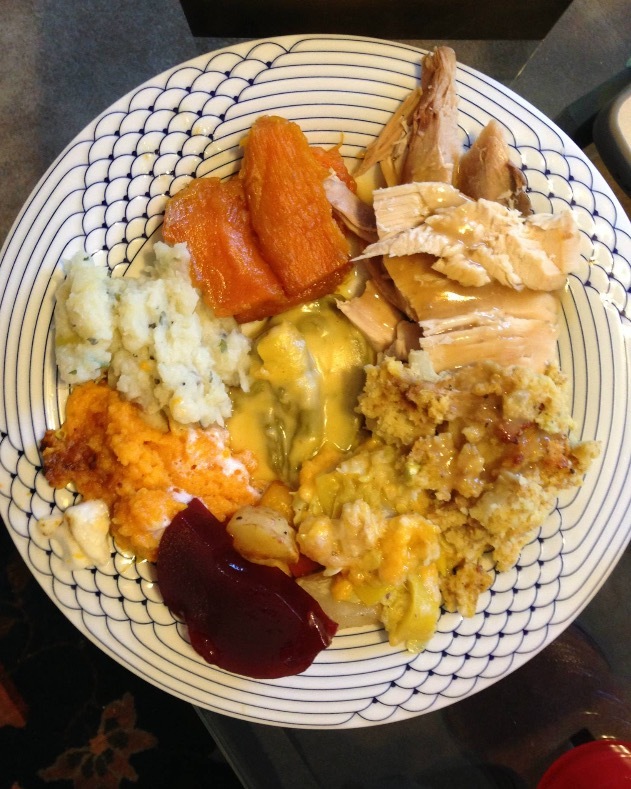 Sweet Potatoes – my family’s Thanksgiving dinner includes not one, but two sweet potato dishes. My Aunt Diane makes a sweet potato souffle with marshmallows on top that is fairly similar to this Traditional Southern Sweet Potato Casserole. When I make the recipe I typically cut the amount of sugar and spices in half because sweet potatoes have such an amazing flavor on their own, but of course the traditional southern version must have ALL the sugar and butter 🙂 Diane also makes a candied sweet potato dish that looks similar to this candied yams recipe. Macaroni and Cheese – Oh Pioneer Woman you do no wrong – especially with this ooey gooey mac and cheese. And for good measure here’s another recipe I’ve been scoping out with panko bread crumbs on top from the Mac and Cheese Chick. Squash Casserole – my Mimi’s secret recipe is the best, but this Paula Deen version won’t steer you wrong either. Brussels Sprouts – If you’re looking for a little veggies in your Friendsgiving feast look no further than this super easy recipe from Ina Garten. The most time consuming part is chopping the sprouts, but worth it for the finished product. 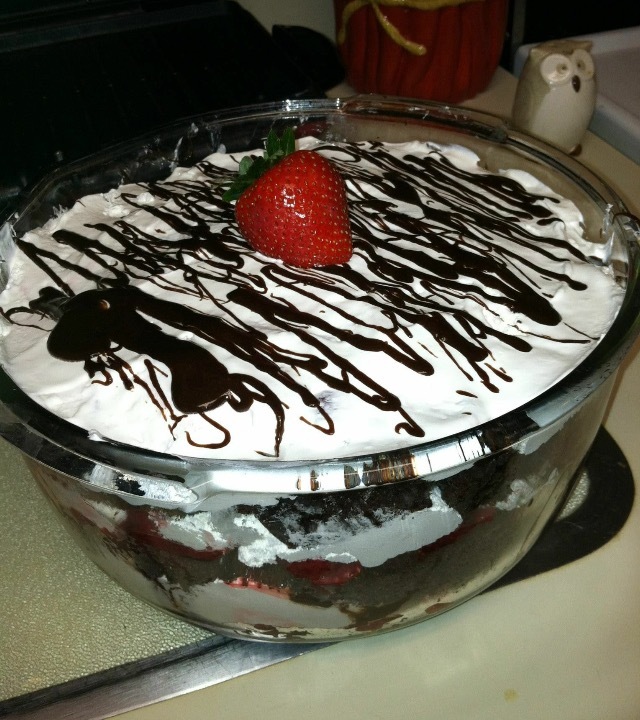 Chocolate and Strawberry Trifle – This isn’t particularly Thanksgiving-y but it is one of my absolute favorite desserts to make for a group. It tastes even better if you make it the night before and allow all the flavors to ooze together. Are you going to a Friendsgiving potluck? What are you bringing?